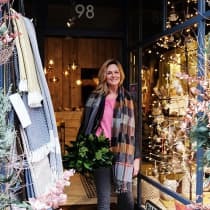 A longtime lover of home textiles, former chartered accountant Alison Satasi found herself disappointed with the ethical offerings in the UK homewares market. She launched her own line of vibrant bedding, cushions, throws and rugs which were made in direct collaboration with fair trade craftspeople in India and beyond. Deciding to expand her reach, she opened Luma, her own homewares boutique in Barnes that specialises in exceptionally crafted interiors items. "Luma is a beautiful treasure trove with lots of unique discoveries, we hope that people feel inspired when they shop with us."